There really doesn't need any words for this before and after. This is a young mom, who just happen to read about the Brazilian Blowout in a mag, and google San Luis Obispo Brazilian Blowout and found me. Her hair came out fantastic. Wow, what a before and after on Amy. She is loving her hair. Before Amy just had a wild frizzy mess. She would ask her husband to Flat Iron her hair before they went out. Now Amy can just dry her hair and go. This wonderful Client found me on the web from Brazilian Blowout. Her daughter in NY had just had it done and look for local business on the Brazilian Blowout website. She called, book and looks fabulous now. She is bring her daughter in after their trip to Egypt. Here we have Tammy (so sweet). Tammy has very fine hair, hard water in Paso, with curl. She had been going to the an upscale salon in downtown SLO. Someone had told her about our salon and decided to try us awhile back. This last visit we did full color and the Brazilian Blowout on her. Her hair texture is smooth and sleek with no frizz. I just got off the phone with her and she is out in the pool having a great hair day. She said its a first for her and her hair. This client had blowed dried her hair with a round brush and said that this is how it is all the time. She came to me through her Hairdresser from finding me on Brazilian Blowout site. Her hairdresser didn't want to get certified and sent her my way. She loves her hair and so did her hairdresser. This sweet Client of mine, came in for Color and said Kellie tell me all about this Brazilian Blowout. I explained to her the benefits of the Brazilian Blowout with the Keratin (Protein) and how it actually improves the condition of the hair by a protective protein layer around the hair shaft eliminating frizzy hair and giving you a smooth cuticle. She is loving her hair. I round brushed her and curled her hair to show her she can do all of that with the Brazilian Blowout. Client hasn't had any chemicals done on her hair for a long time. In fact she has had some really bad experience's. When she heard about the Brazilian Blowout she was excited about the fact of getting frizz free hair and the possibility of it being pretty straight with no commitment she was ready to sign up. As you can see the Before and Afters are amazing. 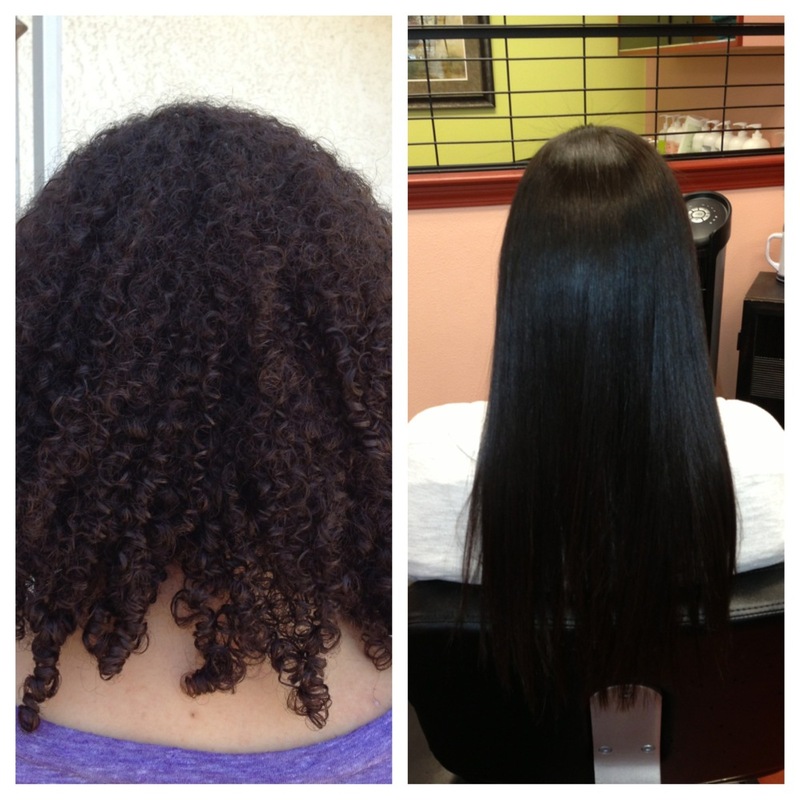 My client here has had both a Japanese Straightening system and the Brazilian Blowout. She loved how the Brazilian Blowout conditioned her hair, added shine, protected it from breakage, and loved living with out frizz. This client has also had her hair Straightened with the Japanese Straightening system in the past too. 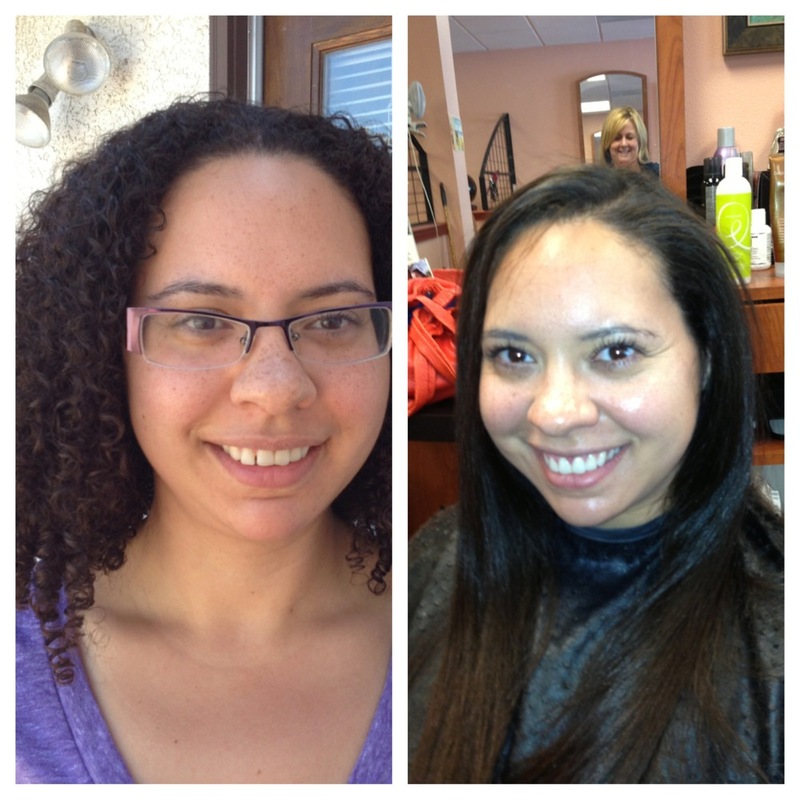 She was looking for something that was less damaging, no harsh chemicals and ready to wear hair. In the past she would have to wait for a whole weekend in her house to pass by after getting the Japanese Straightening system (she had flat hair, wasn't able to wash hair). She called the next day after getting the Brazilian Blowout and she was telling me how she washed her hair and was loving it.